My kids schools held the qualifiers for their "Huntly's Got Talent" competition yesterday. Unfortunately only Yanick got through to the final dancing to the Ting Ting's "That's Not My Name". So we decided to have our own wee competition at home yesterday. Here they are. Please vote in the poll below the videos. Who's got the best moves in my house? 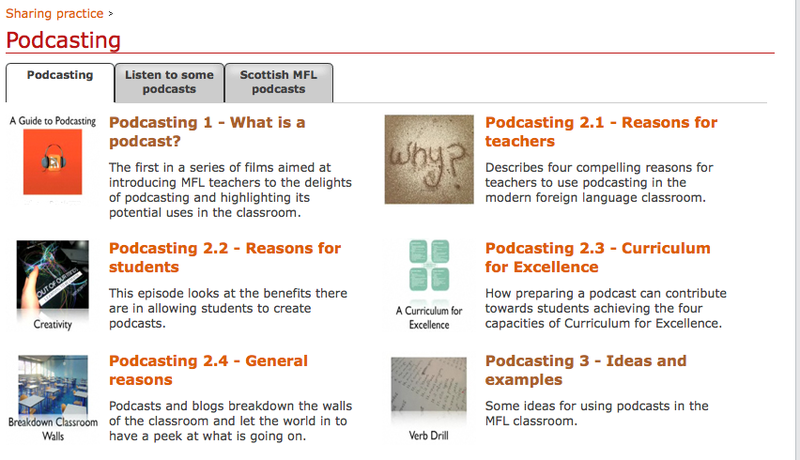 Some time back before the summer holidays, whilst he still worked for LT Scotland, Ewan commissioned me to update the podcasting section of MFLE. 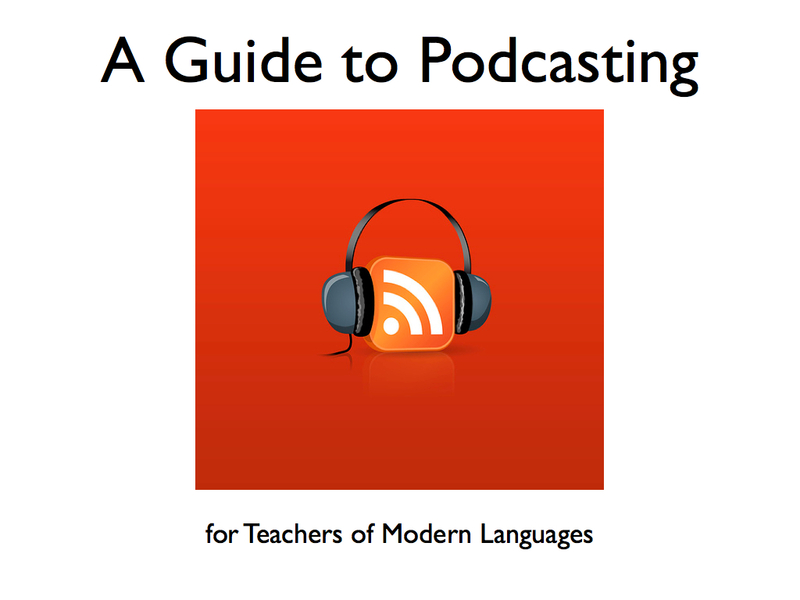 The idea being to replace the existing, written guide with something more representative of what MFLE aims to be; a support service for MFL teachers providing ideas to assist teachers be more creative in the classroom. He envisioned a resource which users would be able to dip in and out of as their needs arose. But most importantly it was to be relatively short and to the point. Recording audio on the go. To help you to idenitify your needs more easily parts 2, 4 & 5 are divided further. All the films are based on stuff I have done in the classroom over the last couple of years or so. In order to make them as accessible as possible, each film comes in 2 downloadable formats, one for computer and one for ipod, as well as the flash version on the website. Attached is also the script of each episode, some of which are more detailed than other, containing hyperlinks to relevant sites, podcasts. Although it took quite some time to put together I really had a ball rising to the challenge of my first commissioned piece of audio visual work. I probably went about things a long way 'round (as usual) and as surs as eggs are eggs there is proabaly an easier way of doing what I did. However I learned a lot about putting together this kind of resource, and it has been a massive help in preparing for the likes of Isle of Wight Conference. NB. Joe beat me to the punch the other day on this but it wasn't quite ready for publication to its intended destination at MFLE. It is now. Thanks to Anne MacLeod at LTS for her work in getting this online. Advance apologies to those who came to this post thinking it will answer all questions about MFL teaching...it will maybe help with some. Today 80+ mfl teachers had a chance to meet up at an in service event organised by Aberdeenshire Council, and facilitated by Pat Young who, amonst other things, is involved in the LTS Virtual Advisory Service. Pat is a very personable presenter who had some very good ideas, which she had used in her own classroom. Her session, An A-Z of Good Practice in Modern Language Teaching, was on the face of it an excellent opportunity for real sharing to go on. Unfortunately the presentation lasted all day and could quite easily have fitted into a morning. Lots of interesting ideas were looking to burst out but we didn't really get the time to discuss and share. In my eveluation I suggested that a future model, and probably less expensive one, would be to invite all ML departments in all the shire schools to come up with 3-5 examples of good practice in their department and be ready, in true TeachMeet style, to deliver a 7 min / 2 min presentation on them should their name appear on the Random Name Picker. Why? get teachers out of comfort zone of sitting and listening to presenters drone on...you might be next. I was also asked an interesting question as well. View my enthusiasm for all things technological, whether or not I still have a place for the more traditional methods of language teaching? Of course, I answered. I do enjoy using fancy stuff but there still is time for text book work etc and I only try to use the tech to enhance my teaching and kids learning...that's the intention anyway. One of my most favourite web based tools has been Animoto, mainly because of its ease of use. About six months ago they introduced animoto for education which allowed educators to sign up and get an all access pass for an academic session. This meant that users could create and download full length videos. One draw back I had found with it was a difficulty in adding simple text to a video so that it could be used as say a vocab learning reasource. i.e picture followed by the word in TL. That was until now. As I am signed up to the animoto blog in my reader I discovered today that you are now able to add text to a vid. Not being the patient type when it comes to new things I had to have a go, and also it kind of fitted with what I am having my S2's do and what I am doiung with S1 at the mo. As I already had the pictures available I didn't take too long to put this video together to help my S1 classes learn the countries of the EU in German, with some cool latino vibes. NB when I did this at first I used umlauts, which on rendering camne out as gobbledygook, so I had to remix it and add and extra "e". I've emailed them about this and will see what comes of it. Tomorrow I will be showing this to S1 and challenging them to come up with something better. all because gmail does a crafty trick of identifying this as your email. In this way you will see their videos as you will receive a message. The important thing to remember here is that in each case they must sign up using the link provided to you by animoto when you signed up for an educators account...it's not all that confusing honest. A tutorial I put together to help my higher students who missed this weeks lessons due to work experience. Tried to record the actual lesson but forgot jing will only let me record 5 mins. Thought it worthwhile on this momentous day to congratulate the US electorate on fianlly getting rid of the worst president ever and electing a breath of fresh air. Here's Will-i-am's version of the Yes We Can speech.